Lumpfish caviar is one of the less costly types of caviar, a delicacy made of salted fish eggs. The lumpfish is a thick-skinned, lumpy cold-water fish found mostly in the North Pacific, but also in the North Atlantic and Arctic oceans. Fish eggs, called roe, have important nutrients. The caviar made from roe retains many nutrients. However, like all caviar, lumpfish is high in sodium and cholesterol. In the United States, the lumpfish is not caught for its skin, which is inedible. The lumpfish, common in the waters of New England, is caught only for its roe. The lumpfish yields tiny, black eggs classified as hard roe, which are female eggs. Male fish eggs are called soft or white roe. 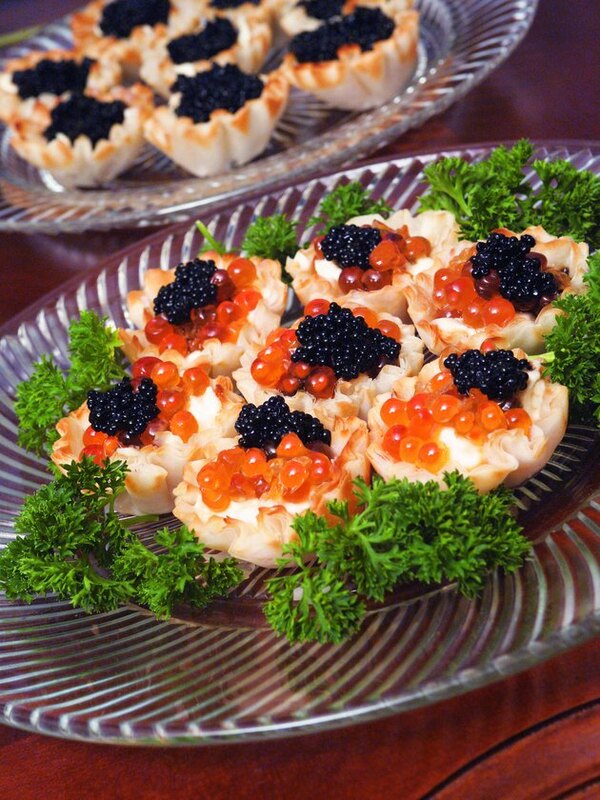 Lumpfish roe is dyed red or black and heavily salted to make caviar, usually served as appetizers or hors d'oeuvres. The bright red lumpfish caviar makes a striking garnish. A tablespoon serving of red or black lumpfish caviar contains 15 calories. Lumpfish caviar contains more salt than other types of caviar. A tablespoon serving size of red or black lumpfish caviar contains 380 milligrams of sodium, according to nutrition labels on packaging. The sodium content in lumpfish caviar supplies 16 percent of the recommended daily value for sodium. The U.S. Department of Agriculture lists 280 milligrams of sodium in a tablespoon of red or black caviar. While your body needs some sodium, health professionals recommend lowering sodium content to prevent hypertension and heart disease. Lumpfish red and black caviar contains 50 milligrams of cholesterol, 17 percent of the recommended daily value, in a tablespoon. The USDA lists 94 milligrams of cholesterol in a tablespoon of red or black caviar. Your body uses cholesterol to maintain the health of your brain, cells and nerves and to create hormones. However, too much cholesterol can cause heart disease. Nutritionists recommend lowering your fat intake to maintain healthy levels of cholesterol in your blood. Caviar contains 3.20 micrograms of vitamin B-12 in a tablespoon serving of 16 ounces. The body needs vitamin B-12 to maintain the health of blood cells and nerve cells. B-12 helps the body make DNA, prevents anemia and helps the body use protein. The body does not store vitamin B-12 and needs to replace it each day through dietary sources. Red and black caviar also contains small amounts of vitamins A, B-6, E, D and K.
The tablespoon red or black caviar serving contains 1 gram of protein, which your body uses to make nearly all of its parts and maintain the health of tissues and cells. Red and black caviar contains 29 milligrams of potassium and 48 milligrams of magnesium, which are important for heart and central nervous system health. Caviar also has 44 milligrams of calcium for bone health and small amounts of zinc and iron. Lumpfish caviar also has important fatty acids, which are recommended for heart health.